SRINAGAR: On the banks of river Jhelum stands a dilapidated multi-storied hotel, Pamposh that was destroyed in a fire on September 15, 2018. Behind the ramshackle building with soot-covered walls and broken windows is the Wall of Kindness, the new concept to Kashmir. The wall that was part of the ill-fated building is covered with used clothes neatly arranged on hooks. Just two days old, the wall has already become an overnight sensation and created a buzz on the internet. Despite a chilling cold, people are seen coming and hanging their used clothes on the Wall of Kindness. Volunteers, wearing red bands, with Who is Hussain written on it, on their biceps are briefing reporters. “Take it if you need, hang it if you have,” is painted on the Wall of Kindness. 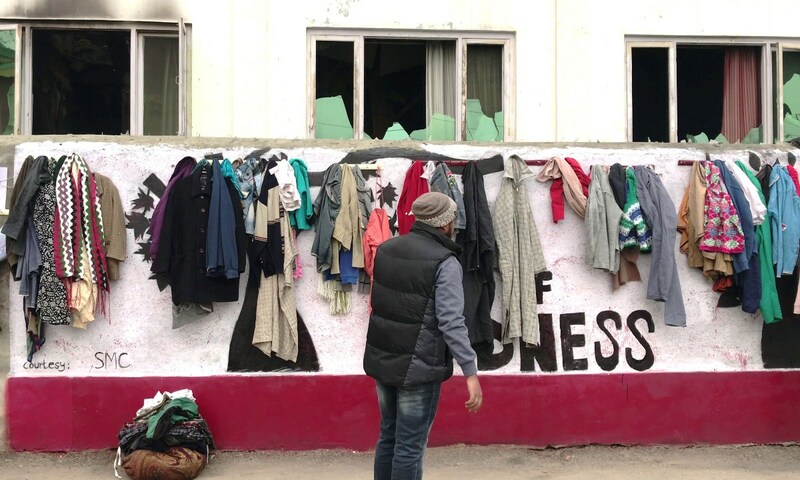 The Wall is a novel concept in Kashmir where people can donate their used clothes and needy ones can take what they need without revealing their identities. The initiative was started by Who is Hussain (whoishussain.org), an organization working globally for the betterment of people. Overnight, a #wallofkindness erupted on Srinagar's famous #Bund. It came at a time when the temperatures are down and people are readying for winter. The wall, organisers said is going to be a permanent fixture for people who require the basics – the clothing, that people donate anonymously. The organization that started in 2012, is based in London, operating in more than 60 cities around the world and is active in 5 cities in India. In 2015, the Organization started their work in Kashmir with the hashtag give, under which they provided ration and other basic necessities in packets to the destitute in the month of Ramadhan. Sadaf Firdous, an entrepreneur by profession is a volunteer for the organization since 2015, the same year when the organization actively started working in Kashmir. “The organization is apolitical and nonreligious inspired by the personality of Imam Hussain, the grandson of prophet Muhammad (PBUH)”, Sadaf said. Her brother Asgar Firdous is the head of the Organization in Kashmir. His sister Snowber Firdous also volunteers for the organization. “The organization is completely non-profit and we work as per the guidelines issued by our headquarters in London,” Asgar Firdous said. The organization is completely dependent on donations. “We don’t get funds from government or any organization. We usually get donations from locals and our volunteers from Kashmir,” Snowber said. The concept of Wall of Kindness started in Turkey and it spread to other parts of the world where people donated their used goods and clothes to the poor. Though the concept is new to Kashmir, people have showcased great admiration and immense support by donating their clothes and many needy people could be seen taking clothes from the wall. Currently, the organization has around 30 volunteers in the valley, and most of them could be seen busy in maintaining the wall and making an action plan for the future. The wall of Kindness being the latest, the organization is already running many other campaigns that include It starts with you where they inspired people to donate and raise funds for the poor people. The organization has also conducted awareness campaigns and cleanliness drives in remote areas like Zadi Mohalla where they raised awareness about health and hygiene among locals. “We are planning to carry it further. We are seeking permission from authorities to identify such more walls all over the valley. We want people to turn up and inspire others to do the same,” Sadaf added. Inspired by Srinagar initiative, students of Maktab-e-Bulul ilm, replicated Wall of Kindness initiative at Imam Bargah at Budgam. On the first day, a number of clothes were donated by people for poor and needy.